I was disappointed you didn’t contact me for a response before posting this, but I did email you a copy of it. However, it came back with a note saying you’re out of the office until the 15th. With that in mind, since Josh sent you his original email to me, here is my response back to him. We are going to have to agree to disagree on this one. And please, remember that this wasn’t written by Lary the Mayor, but Lary the Editor, so please don’t confuse the two. I have taken a much softer editorial approach to dealing with other electeds in the time I’ve been Mayor since we all have to work together. However, I didn’t abdicate my right to express an opinion or an observation either, and in my view the two issues brought up in the Business Journal were so blatantly wrong, they deserved to be brought to the attention of the business community in general. 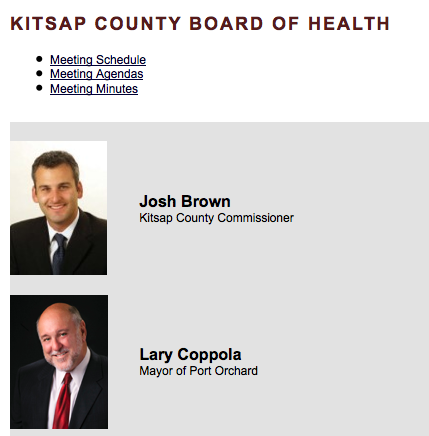 What happened both at Lange’s Ranch and at KRRC follows a long-established pattern by Kitsap County, and especially DCD, of working against the local business community and treating it as an adversary rather than the asset it is. The KRRC issue is such a blatant waste of taxpayer dollars — 12 years and 3 losses in court against a non-lawyer — that it openly defies what otherwise would be considered responsible stewardship of the taxpayer’s money. It has become a clear case of using the massive power of government against the little guy. As a county commissioner you should be ashamed to even be a party to this, much less doing absolutely nothing to prevent this ongoing miscarriage of justice and blatant waste of limited resources. As for Lange’s Ranch, this issue never came before the Health District board — and why would it — so how could it be commented upon in that setting? The DCD issues speak for themselves. There is no misrepresentation of facts here, and certainly no lies have been told. Did you chastise the Kitsap Sun as you have me? They broke these stories — I simply offered personal observations on them — nothing more. So with that in mind, I believe you owe me an apology for making such a statement — especially on the public record. I would expect that in the future, if you have an issue like this, that you will bring it to me directly for gentlemanly discussion. By the way, here is the link to the original editorial that JOsh got upset about.